Cabinet photograph; in black and white. The photograph depicts Sophia Kerr Taylor surrounded by four of her children. 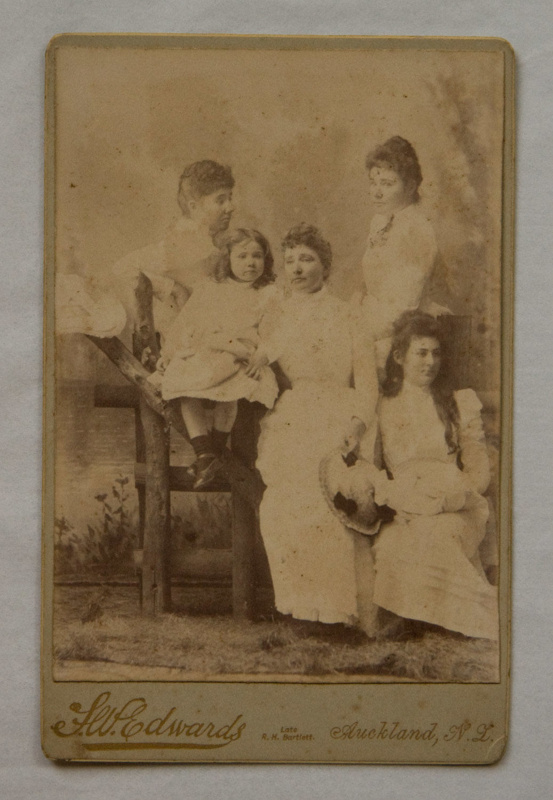 At top left is Mildred, to the right is Winifred, at bottom left is Muriel or possibly Theodore, and at bottom right is Violet. The family are seated in an 'outdoor' studio scene. The photograph is mounted onto pale blue card, with embossed details for the photographer, J. W. Edwards, at the bottom edge. For more information about the Kerr Taylor family and Alberton, which is cared for by Heritage New Zealand Pouhere Taonga, visit our website.